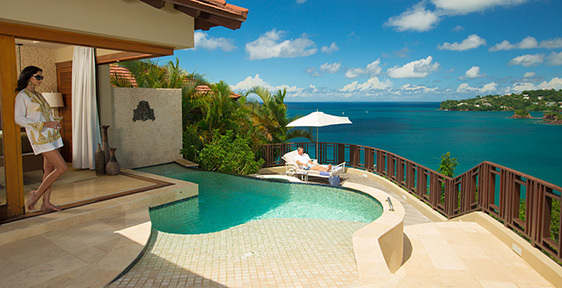 The epitome of Luxury, their elevated “Sunset Bluff Millionaire Butler Villa Suites with Private Pool. Sanctuary” come with 180 degree views, rotating 46” plasma TV's, a private whirlpool and infinity pool and fully opened glass walls offering serenity bedroom views. 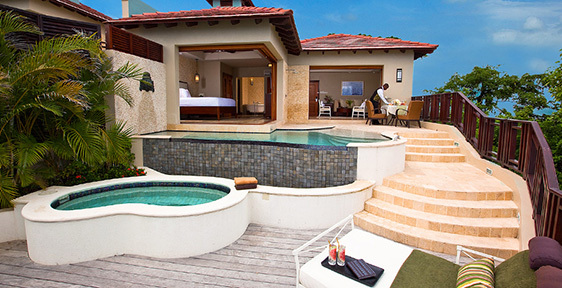 The heightened elevation of their “Sunset Bluff Honeymoon Oceanfront One Bedroom Villa Suites with Private Pool” offers breathtaking views and the feel of a “Resort within a Resort.” Complimented with 24 hour room service, this is a vacation defined by elite privilege and seclusion. A half mile “Regal style Plantation” gated entrance driveway, slowly descending through the manicured fairways, to an expansive vista and beach front. Sandals Regency La Toc Golf course with nine holes located directly on the resort offering complimentary green fees. Only ten (10) minutes from George F.L. Charles Airport (SLU), Shopping and Castries and one (1) hour from the Hewanorra International Airport (UVF). Stay at One, Play at Three”. Sandals Resorts “World's Leading All-Inclusive Company”, 19 years in a row. Sandals Resorts “Caribbean's Leading Hotel Brand”, 22 years in a row. Sandals La Toc “Saint Lucia's Leading Spa Resort”, 5 years in a row. Five Star Diamond Award - American Academy of Hospitality Sciences. Five Star Diamond Award for La Toc Restaurant - American Academy of Hospitality Sciences. Chic, secluded and utterly romantic, these Love Nest Villa Suites rival the most luxurious multi-million dollar island homes. Set 150 feet above sea level atop a picturesque sunset bluff, these villas feature fully retractable glass walls in the master bedroom and living room that open up to 180° unobstructed views of the Caribbean Sea from a three-story sundeck. The private deck boasts complete privacy so you can enjoy the villa's dining area, lounge chairs, and zero-entry plunge pool with waterfall and whirlpool. Inside, these dramatically beautiful suites offer you and the one you love over 1,000 sq. ft. of pure relaxation with modern amenities such as two HD Smart televisions, a king-size bed, fully stocked bar, airy living room, contemporary bathroom with double vanity, walk-in shower, free-standing tub, and a personal butler. Here, you'll enjoy private al fresco dining, a refreshing swim in your private infinity pool or lazy days sunbathing. Butler Elite and 24-hour room service are included. With nine tantalizing restaurants awaiting your pleasure, you'll find deciding on dinner your most difficult task of the day. Romantic ambience, impeccable service, and scintillating international cuisine make every dining experience a vacation in itself. Sandals chefs are known for their authenticity and dedication to detail as is expected in the most acclaimed restaurants around the globe. 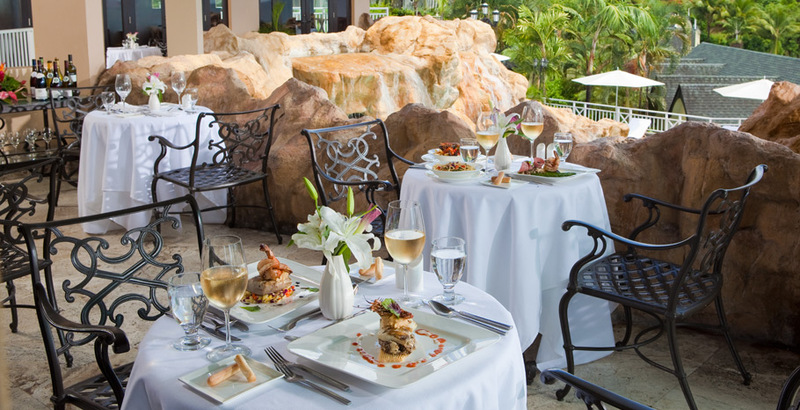 Accompanied by the renowned Mondavi Wines, every meal becomes a celebration of your love at Sandals Regency La Toc. Resort Evening Attire: Dress pants/trousers or jeans for men, long or short sleeved dress shirts (with or without collar). Dress shoes or elegant sandals. No shorts, t-shirts, sleeveless shirts or sneakers. Savor traditional Italian cuisine whether indoors or Patio dining. À La Carte breakfast, lunch and dinner. Dress Code: Resort casual wear daytime and at night, resort evening. Enjoy a scrumptious meal in an atmosphere of pure British bliss. This distinct restaurant features exotic Teppanyaki-style dishes prepared at the table. It is air-conditioned. La Toc (French Cuisine) Reservations required. This air-conditioned restaurant features authentic French cuisine with white gloved service. This popular St. Lucian restaurant serves a dreamy selection of favorite St. Lucian and Caribbean dishes and desserts. Set overlooking the beach with no walls to muffle the crescendo of the crashing waves, Neptune's offers classic Mediterranean cuisine. Dinners will delight in Neptune's casual European elegance, served à la carte. Made to order, Italian brick oven thin crust pizzas, serving different varieties of hand tossed pizzas. Sandals and Beaches Resorts bring a taste of the Far East to the Caribbean. Named after Soy Sauce, a traditional ingredient in the art of Sushi, Soy offers exciting flavors and exotic sushi creations made to order. This restaurant features International cuisine, served buffet style for Breakfast and Lunch with a breath taking view of the ocean. Pavilion Main Bar: 12:30pm to 2:30pm and 6:00pm to 12:00 midnight. Tipping: There is a “No Tipping” policy at the resort for all Team Members except for Butlers and Spa Therapists.